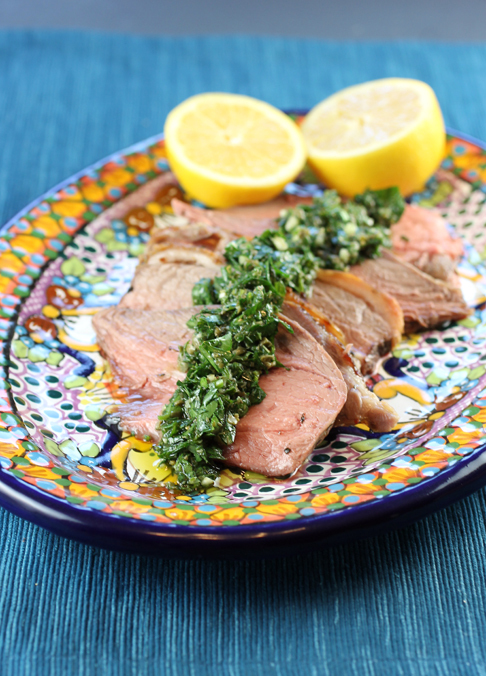 Rosy slices of lamb topped with a vibrant salsa verde. Let’s face it — bones can be a bit of a pain to deal with. Just try eating chicken wings gracefully. Or de-boning a whole fish in front of guests without mangling it. But bones serve a purpose in cooking. They add more flavor to the flesh as it cooks. They also conduct heat, allowing the meat to cook more evenly with less shrinkage. So when Superior Farms, one of the largest distributors of lamb in the country, offered to let me try any cut on the house, I went for one with a bone. A big bone. I chose a bone-in leg of American lamb because it’s not a cut you find all that easily in markets these days. Sure, you can get a boneless leg of lamb with little effort, but one that still has a bone in it often requires a real search. That’s because it’s a lot heftier to handle. It’s also more challenging to carve. But what a dramatic presentation it makes for at the table. Superior Farms, which has been working with lamb ranchers since the 1960s, sells its lamb nationwide, including Albertsons, Draeger’s, Andronico’s, Lunardi’s, Save Mart, and Mollie Stone’s. 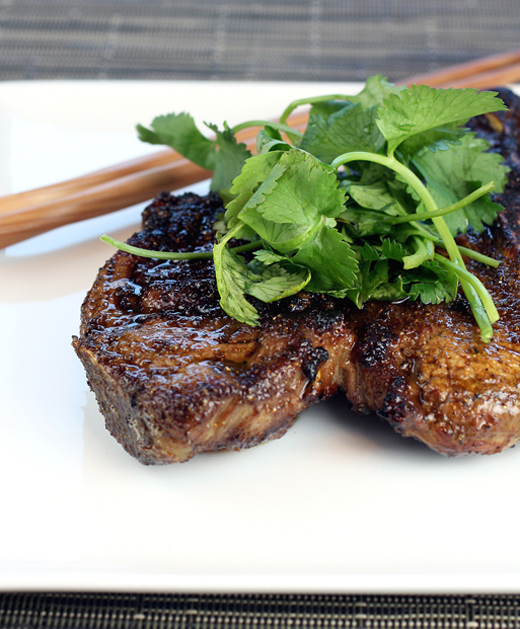 With a fine cut of meat, I like to keep the preparation simple to let its natural flavor shine through. That’s why “Roasted Leg of Lamb with Mint Salsa Verde” was a perfect choice for this bone-in leg. A delicious centerpiece — a bone-in leg of lamb. 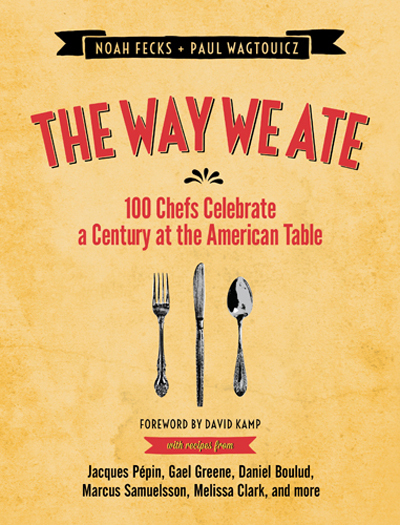 The recipe is from the cookbook, “The Way We Ate: 100 Chefs Celebrate a Century at the American Table”(Touchstone), of which I received a review copy. The book is by food photographers and Tumblr bloggers, Noah Fecks and Paul Wagtouicz. 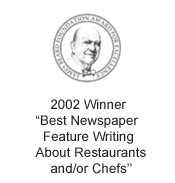 Together, they explore the culinary touchstones of the last American century, spotlighting recipes by culinary luminaries Jacques Pepin, Daniel Boulud, Marcus Samuelsson, Ruth Reichl and many more that capture the spirit of a certain year. For instance, for 1909, a year the authors note brought the first photos of the remote North Pole and an overall arching sense of exploration, they present a recipe for “Baked Alaska” by Chef Travis Post of New York’s Yunnan Kitchen. For 1999, which saw the debut recordings of Britney Spears, Christina Aguilera and Jessica Simpson, there is a recipe for “Life After Love” Cocktail by New York City bartender Greg Seider. The lamb recipe highlights 1956 when “My Fair Lady” took the country by storm on Broadway and folks found themselves fascinated by all things British. New York Times writer Melissa Clark was tasked to come up with an elegant British dish that would appeal to Americans, too. 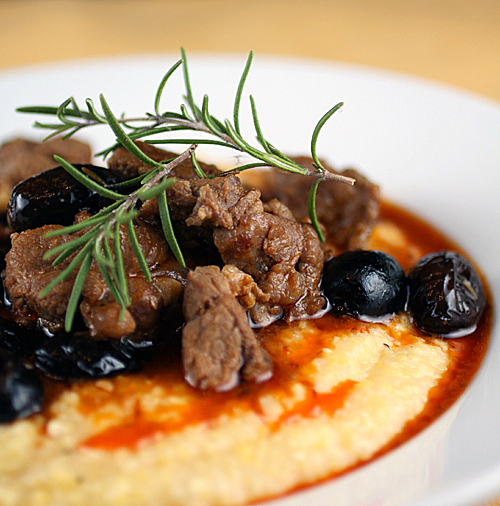 She succeeds marvelously with this dish — the epitome of a Sunday roast but with a Mediterranean sensibility. The leg of lamb is rubbed with garlic, thyme, salt, pepper and olive oil before it’s tucked into the oven. As it cooks, stir up a simple sauce of fresh mint, parsley, garlic, capers, salt, pepper and more good olive oil. It’s the refreshing flavor of mint without the cloying sweetness found in the typical mint jelly. 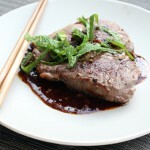 The chunky fresh sauce also lends a lovely brightness to cut through the richness of the lamb. Let the lamb rest for about 15 minutes, then grab a sharp knife to trim rosy, juicy slices off the bone. It takes a little more effort. 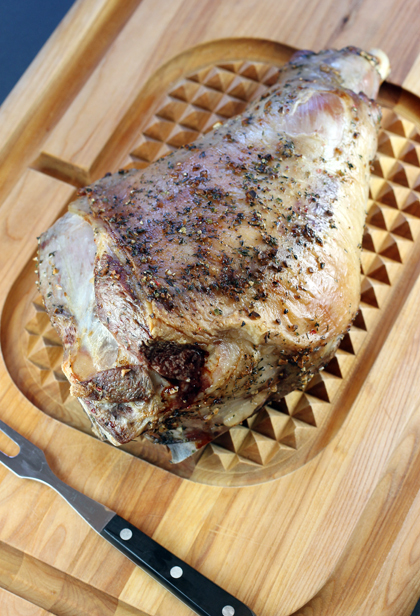 CONTEST: One lucky Food Gal reader will win a free bone-in leg of lamb from Superior Farms to make this recipe or any other favorite one. Entries, limited to those in the continental United States, will be accepted through midnight PST May 31. Winner will be announced June 2. You’ve already read my take about how bone-in meat can seem like a hassle, but rewards you in the end. 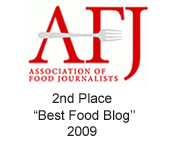 Just tell me something else — food-related or not — that seems initially like such a bother but is worth it in the end. Most memorable answer wins the prize. Rub the lamb with two-thirds of the garlic, the thyme, and 1/4 cup olive oil. 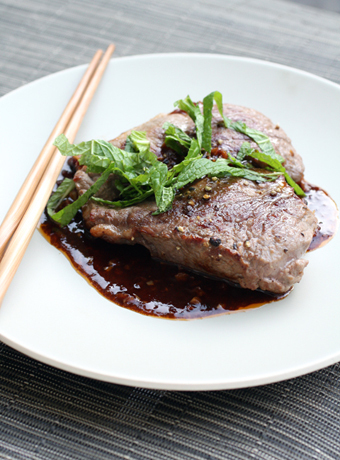 Season the meat with 1 tablespoon salt and 2 teaspoons pepper. Cover with plastic wrap and refrigerate for at least 2 hours or overnight. Remove the meat from the refrigerator for at least 30 minutes before cooking. Preheat the oven to 400 degrees. Place the lamb in a large roasting pan. Roast 30 minutes, reduce the heat to 350 degrees and roast until medium-rare (140 to 145 degrees on an instant-read thermometer), 60 to 90 minutes more. Remove lamb from the pan and rest for 10 to 15 minutes before carving. While the lamb cooks, in a small bowl combine the parsley, mint, capers, and the remaining garlic, salt and pepper. Stir in the remaining 1/2 cup oil. To serve, transfer the sliced lamb to a large serving platter. 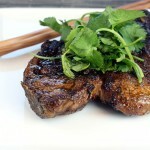 Spoon the salsa verde over the meat; serve with lemon wedges. Delicious! The meat is cooked to perfection and looks really tender. For me, the food-related thing that first comes to mind is making a big batch tomato sauce for pasta from scratch. Of course, the first time I decided to do this, I didn’t bother to consider the relatively diminutive size of my tomatoes in their 20 lb box. What a project it was to cut an “x” in the bottom, blanch, peel, and strain (to remove seeds) all 20 lbs of tiny tomatoes! Never mind the subsequent cooking down of them. It took a lot longer than I was planning on spending. But after reducing and combining with olive oil in which garlic, basil and red pepper flakes had been steeping – oh my, how delicious. Sweet but still well balanced and with enough acid to keep it interesting. Better than just about any sauce I’ve ever had in any restaurant. I guess I’m biased because I made it, but I think I’ll allow myself that much. 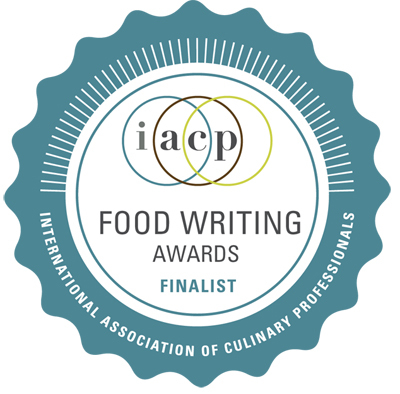 I hope it’s not cheating to choose another Melissa Clark recipe for the contest prompt. I personally will cook everything and anything that sounds good regardless of effort, but when Melissa came out with her story on reinvented casseroles (which I rarely make), the reaction via the NYTimes comment section seemed swift and condemning. I was nearly turned off because the word of the people seemed to be that casseroles are easy and hands off and she was making them unnecessarily complicated – and her take on the Mexican casserole did seem quite difficult with its necessity of acquiring exotic ingredients and constant attention: http://www.nytimes.com/recipes/1016157/black-bean-chorizo-casserole-with-pickled-onions.html. But I went ahead anyway, and the deep pleasure I felt at first bite, along with my boyfriend’s eyes lighting up (this man can live off of just bread and cheese forever and be happy) and I knew I – thanks to Melissa – had come up with something special. I would actually love to try this dish with lamb. Lesson learned: it’s good to trust a great source over those too stuck in the familiar to try something updating a classic and ultimately amazing. what seems initially like such a bother but is worth it in the end? my first thought was parenting (i’m being completely honest here) but more specifically, as i am at the end of baseball season, i’d have to say my kids’ sports teams. it’s a huge investment in money and time. schedules are rearranged, homework has to find a time in there somewhere, weekends are hijacked… but when i see the lessons learned by my child or the satisfaction when he pitches well or makes a great play, it is all worth it. the life lessons my children learn about teamwork, resilience, practice and humility are truly worth all the sacrifices. After having being a stay-at-home mom to 4 young children, I am trying to get back into the job market by using my college degree to teach elementary school, which is my passion. I am currently going through a training program this summer and pass all the required state exams. With young kiddos at home and a baby, it seems sometimes impossible to study for my exams because of the constant demands and noise factor that are involved in our household. When I feel so overwhelmed and exhausted at the end of the day, I wonder how I could manage a professional career and my family life, but I remember that countless women have done it around the world, and I need to hang on. If I want to help provide for my children and fulfill my life’s calling to be a teacher, it will require that I keep my eyes on the prize and find the way that best works for my family. The Holidays put us into a national frenzy,and more or less for some of us. As much I love and enjoy Thanksgiving, cooking so much food in one day stresses me out so much because of all the hard work involved. However, with a little help from everyone, we get through all the meal preparation, it is so worth it! T see the whole family sitting around the table and give God our thanks is such a blessing in itself! Something that can be so difficult sometimes is the discipline of an almost 3-year-old. He likes to test our limits as parents at every turn. Last week we spent 4 HOURS in a headlock over picking up a few simple items off the kitchen floor. He knew he couldn’t have breakfast or lunch or do anything until it was done, and he refused. I spent the entire morning picking him up and putting him back in the kitchen and telling him to pick up. I was very frustrated. Then just a couple days later when we were at my in-laws, he obeyed the first time every time and that really impressed all our relatives. Just shows that patience and perseverance DO pay off! Other than composting, it made sense to save water used to wash fruits, vegetables and rice. Now I use that water for my vegetable garden. Bit of a hassle, but worth it. Something that seems like much trouble but so worth it, is having cooking lessons for my granddaughters. I always try to accommodate them when they want to learn even if I don’t feel like it. They will individually ask me to teach them to cook some family loved recipes. Italian Christmas cookies, lasagna, pasta sauce and carrot cake. These are some of the things I have taught them to cook. They are age 12 and 14. I’m so glad that they have an interest in learning from me, their grandmother. Wanting to be able to carry some of the traditions into their families when they do have them. Homemade Pastrami is my entry. To make it from scratch, first buy a Brisket and then prepare the brine it with the correct spices. Soak the Brisket in the brine under refrigeration for 10 days. Then soak the Brisket overnight in plain water to remove the salt. While that is all going on, make a Pastrami rub that uses a half dozen spices. Take the Brisket out of the water, dry it, and coat with the Pastrami rub. Then smoke it at low temperature for around a half a day. Takes a lot of time and work but the result is incredible. One bite and you will never buy Pastrami at the supermarket again. I now confess that I use a cheat that shortens the process. I buy high quality Corn Beef, soak it overnight, then proceed with the rub and smoke it. Not quite as good but saves a lot of time. refrigerator space, and still is better than anything you can buy at the supermarket or most Bay Area Deli’s. I also make my own Bagels which require making a yeast dough, two rises, boiling in water, then baking. Takes a lot of time but the results are also incredible – real Bagels instead of Bagel shaped bread. Pingback: How to roast garlic?